A deep dive into the hidden world of constructed languages (Dothraki, Klingon, Esperanto) and the fascinating people who make them. Conlanging, The Art Of Crafting Tongues is the first feature documentary about the global phenomenon of constructed languages and the extraordinary people who invent them. 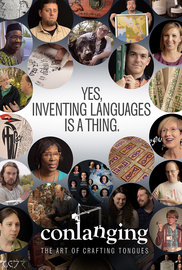 From languages like Klingon and Dothraki in blockbuster productions, to the diverse personalities engaging in the practice today, to its relevance in education and even efforts to save dying languages — there's much more to conlanging than almost anyone might imagine. Film and bonus feature details: in English with English descriptive captions. Includes everything! You'll get the full documentary, the 50 minute long bonus feature and the soundtrack. The full film and the 50 minute long bonus video. Save a buck! Already seen the documentary? Get just the 50 minute bonus feature of material not seen in the film. 4 Comments. Add your thoughts.